Once in awhile you come across a bottle with beautiful swirls of color throughout. It indicates that the glass was not fully "mixed" to it's intended blend of color. I have seen some spectacular swirled bottles, and Marty Hall had a wild display of unembossed bottles with this effect at the Reno National Show. Here is a pretty straight up olive yellow green bitters with ribbons of red amber spiraling throughout, from the top to bottom, and all the way around. While from a distance this effect tones down the "green", in backlighting it is really something. Unfortunately, my camera was not able to capture the swirls as dramatic as in person, but you get the idea. Maybe others could post their "swirled" glass? 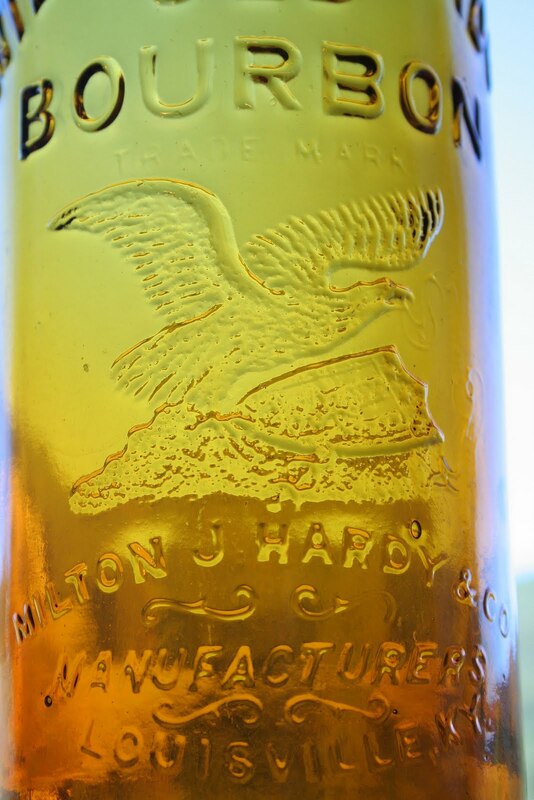 I have always loved the Gold Dust whiskeys. They are one of the stereotypical Western bottles with everything going for them. I have not been fortunate enough to extract one of these beauties from the ground, but I am grateful others have been. Here is a very light and heavily whittled N. Van Bergen Gold Dust. 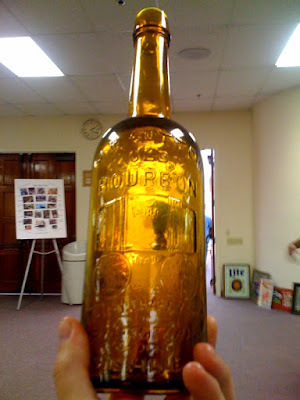 It was dug in Virginia City, Nevada in the early 1970s, and only recently found it's way to Oregon. The N. Van Bergen examples (T-155) are a bit later than the "John's", but seem to be equally as beautiful, with color, and character rivaling their earlier brothers. As far as numbers in collections, I believe there are about twice as many John Van Bergen's as N. Van Bergen's, with perhaps 13-15 of the latter known. It is probably a good thing that the aqua versions began being blown in the early 1880s or there would probably be alot more of the "N"s out there! To me, both of the amber Gold Dusts are equally desirable. "my bottle is from a private collection"
"just as good as the bottle you mentioned - even better. great color and perfect"
SCARCE: - GENUINE - DR HENLEY'S WILD GRAPE ROOT IXL BITTER'S BOTTLE. EXCELLENT CONDITION - NO PROBLEMS OF ANY KIND. 12 INCHS TALLS. - HAS GLOB TOP. SHIPPING COSTS INCLUDE INSURANCE, PROFESSIONAL PACKING AND FULL POSTAGE. Opening price on this beauty is $3,150.00 with a “professional” $45 shipping cost. Now don’t all of you start bidding at once! 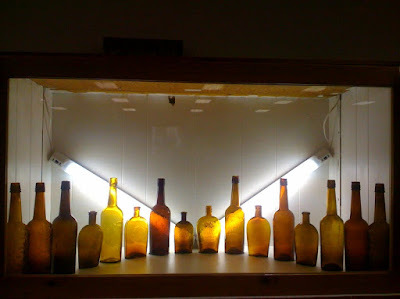 The Western Bitters News site is still all fouled up so I am encouraging all of you bitters lovers to go ahead a post your bitters related items on this here whiskey/western glass site. Seems the soleagent is off digging so I reckon he won't mind us commandeering his site for awhile! Every wonder what the story is behind Champagne Mead ? 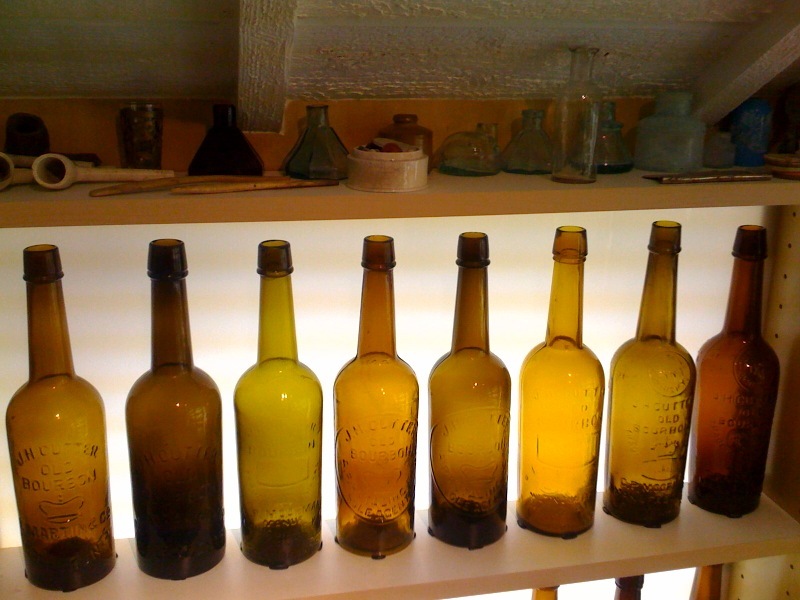 Ever wonder why Champage Meads and Crystal Sodas seem to come out of the same privies ? Here are some documents that shed light onto this beverage and the interesting ventures of Mr. Asher S Taylor. Apparently we are still looking for that elusive shred of evidence that precisely dates this old J.H. 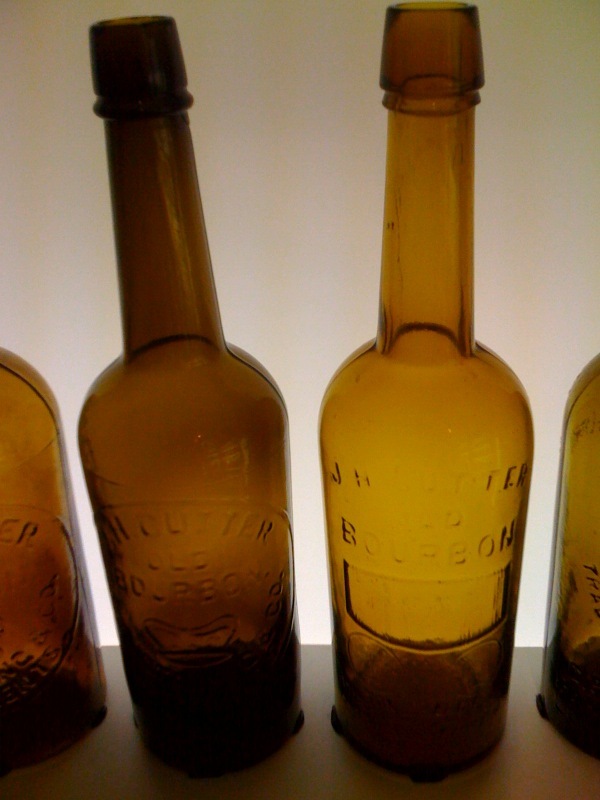 Cutter bottle. Was it as early as 1866? 1867?? I'm in the 1868/1869 camp! Is it the first embossed western fifth? I believe it is. 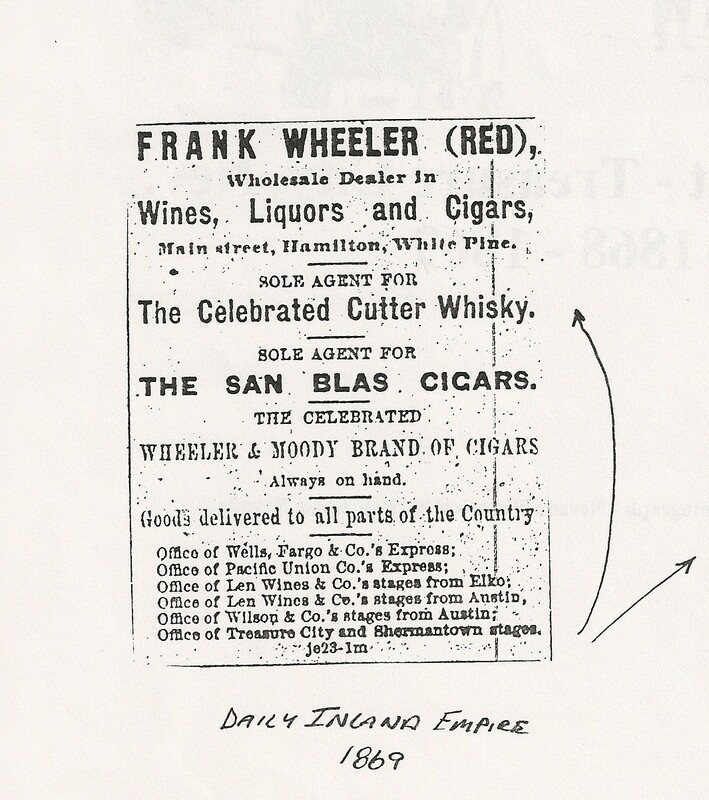 Here are a couple of Hamilton liquor dealers that are advertising "Cutter" whiskey in 1869. I guess it could be a different Cutter whiskey, but the only Cutter bottles that are found up there are t-49's. His ad reads: " Nice, comfortable straw beds. One Dollar per night, crickets thrown in for free"! Check out this interesting article that appeared in the Salt Lake Weekly Telegraph Mar. 25, 1869. I need to go back and find the original article, this copy was typed from an old microfilm copy... you know- back in the day!! Here are a few pages that appeared in San Francisco and Sacramento papers that the reader might find interesting. 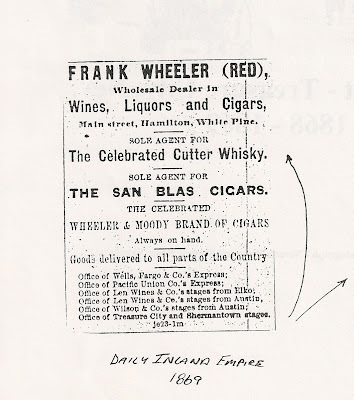 Warren F., in his constant research, has located a wealth of interesting "whiskey information". He has been kind enough to pass it along. 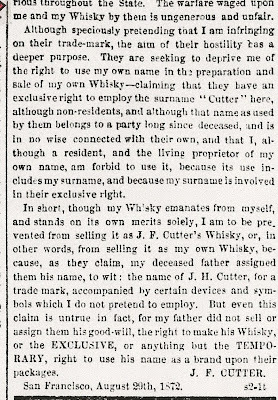 John F. Cutter felt it necessary to have this article published in a California paper on Sep. 2, 1872. 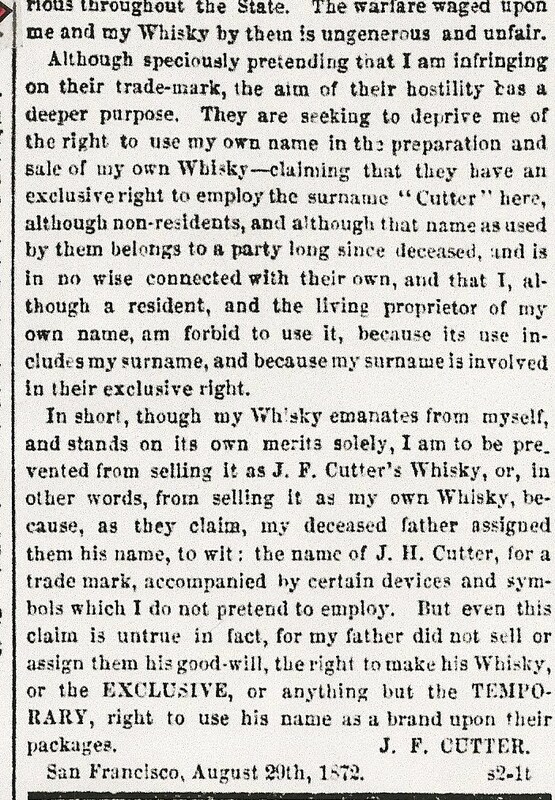 Interestingly, John F. Cutter (Martin and Henarie)? 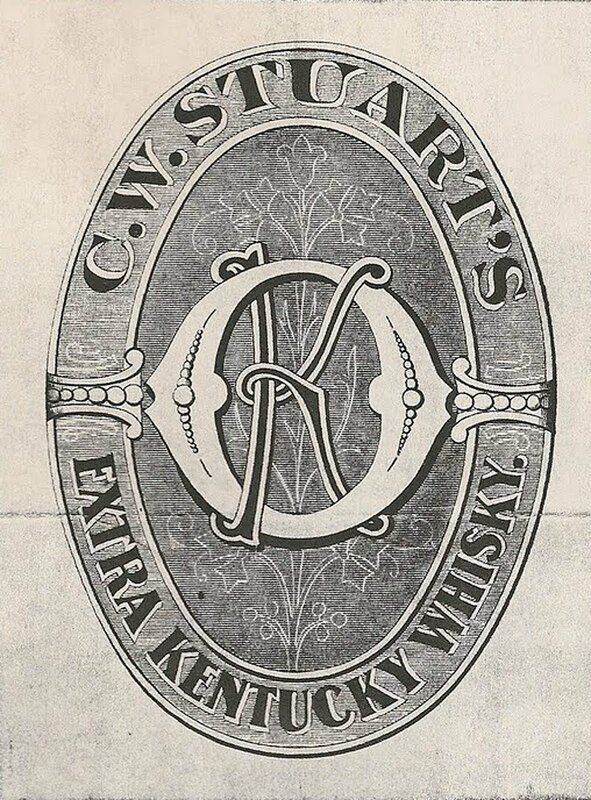 also had registered the brand in California in April of 1870. This is the earliest ad I have seen for J.F. Cutter Extra. Feb. thru May 9th, of 1871. Ad refers to the product being "put up in large bottles". This is referring to a fifth size container, instead of the formerly popular and more standard 'sixth'. 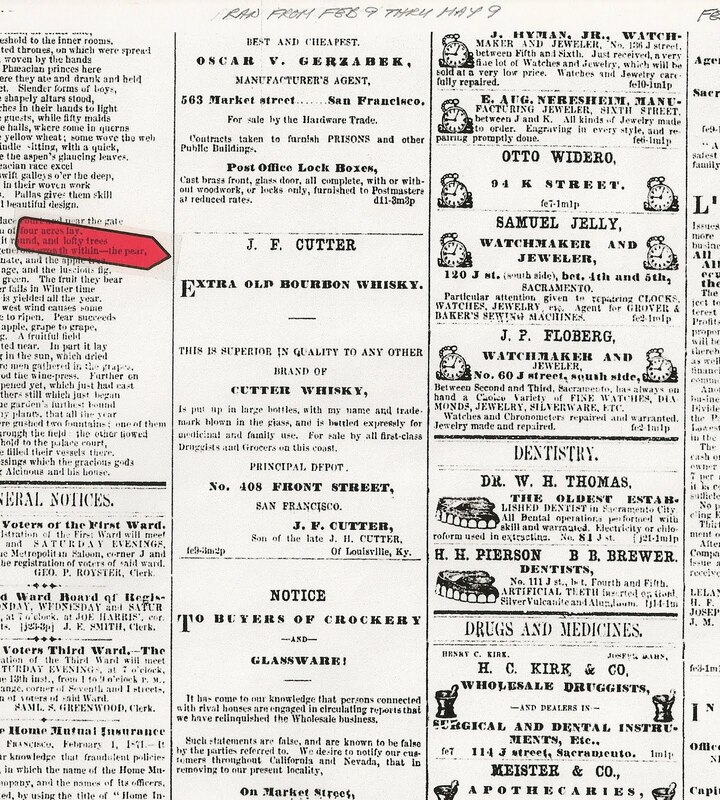 This three part article was published in the San Francisco Daily Call in August of 1875. A.P. Hotaling's reply to a card "signed by E. Martin & Co." This is three years after J. F. Cutter voiced his piece above, so this is not replying directly to John F's statements. His comments on John F. Cutter are interesting. His dislike of Mr. D.V.B. Henarie, E. Martin's managing partner, is quite evident. 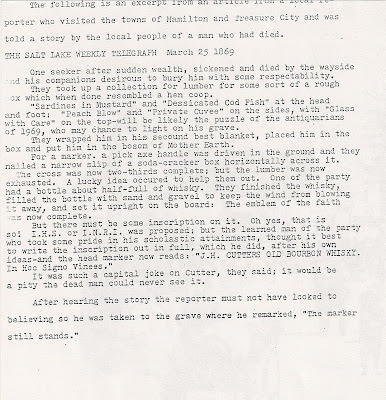 In the comments column of the previous J. F. Cutter post, Bumstead wanted to see more off color. Ask and ye shall receive. Back in the mid to late eighties I had a job that actually paid well. While nearly everyone else was stuffing blow up their sinuses, I was busy stuffing glass on my shelves. 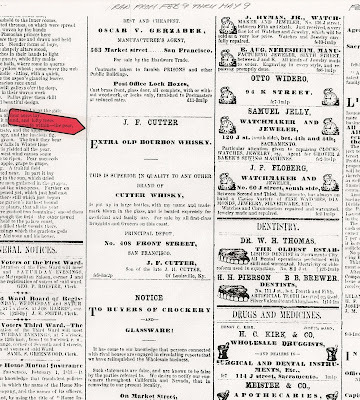 The internet hadn't come of age and auction houses still relied on printed media. Some were going the extra mile and printing their catalogues in full color, most were not. Back then, Harmer Rooke galleries was a force to be reckoned with. They were at the top of their game and were regularly sending out catalogues stuffed with both quantity and quality. In late November of 1990, a catalogue arrived in the mail. Nice color cover; black and white inside. This was the Christmas edition and had something for everyone. 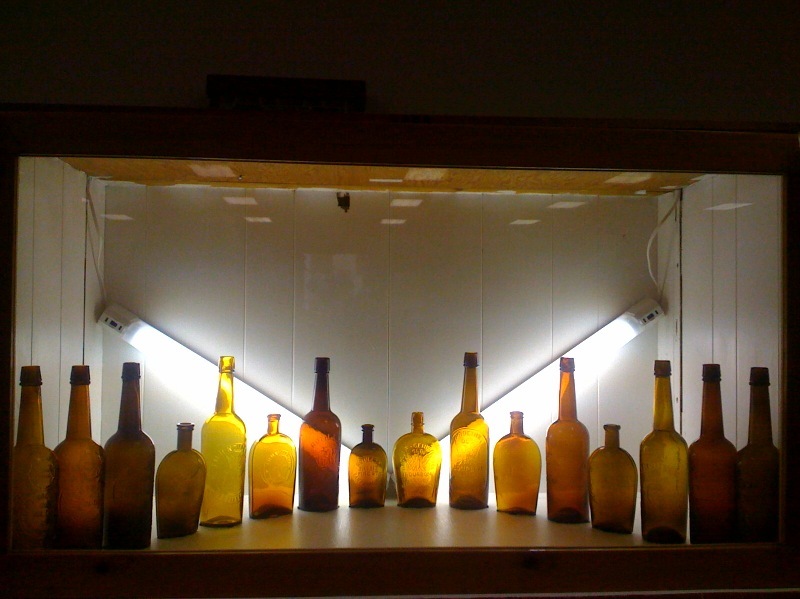 Marbles, political pin backs, autographed celebrity photographs, stoneware, dovetail boxes, and yes, even bottles. I made a quick pass through but it was anything but riveting. 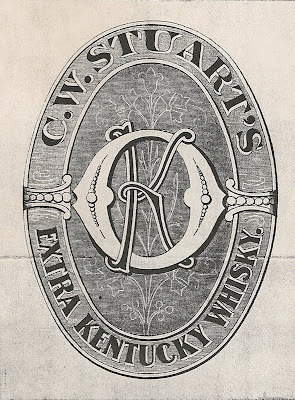 Hmm, lot 191 wasn't too bad; four western whiskies. There was a Dinnigan in the bunch. Oh well, I'd plug in a frustration bid. And then I spotted IT - lot 193; "Whiskey Bottle Lot" "Including a Milton J. Hardy Bourbon / amber and a back bar Sherry / silver on clear glass. I called Chuck at the gallery and asked him about condition. (you remember Chuck aka Charles G. Moore - nice guy gone bad in the early 90's). Nope, nothing wrong with the bottle. 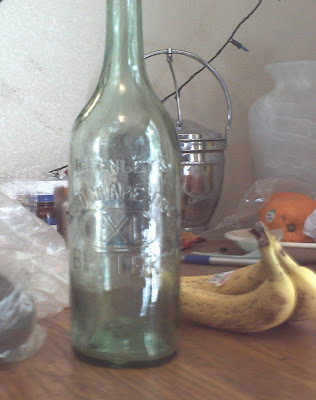 Still had the original cork in it. Came out of an attic back east. And so, off to the races we went. Actually, it got off to a slow (real slow) start. Buried back on page 50, the lousy black and white photo was tough to get excited about. But I stayed the course and a couple of days before the auction hammered it caught on fire. The auction closed at 5:30 EST. With a half hour left, I called to place one last bid. Chuck was busy so I spoke with his wife, Melanie. "Just what shade of amber is it?" I asked. Amber, she repeated? No, it's more like a lollipop. And with that, I plugged in a shoot the moon left bid. A week or so later it showed up on my doorstep. Even lighter yellow than I'd hoped for. A strike so crisp that you can cut steak with it (a Wichmannism...) and dead mint. Thanks to Melanie (and RTS for not outgunning me) I ended up with what I still consider to be one of the nicer pieces on my shelves. Cheap no; but worth every cent! Here are two Star Shield Cutters that do not garner as much respect as their earlier versions. Produced in the late 1870s to early 80s, these fifths are pretty tough to find in any color but "old amber". I have not seen this bottle in a super dark chocolate come to think of it. Occasionally they can be found in green tones, but very ocasionally. There was much more than just whiskeys at the SD Show....Here's a rainbow of colors in different shapes, sizes, and molds. Simply a gorgeous display that this photo fails to deliver proper justice! Here is a Western whiskey-pairings/counterpart display. Late 1860's Western-blown Whiskey sixth in a solid Green coloration w/ glass swirls, knobby top, and lots of character and whittle. Dug a few years ago in So Cal!?!? 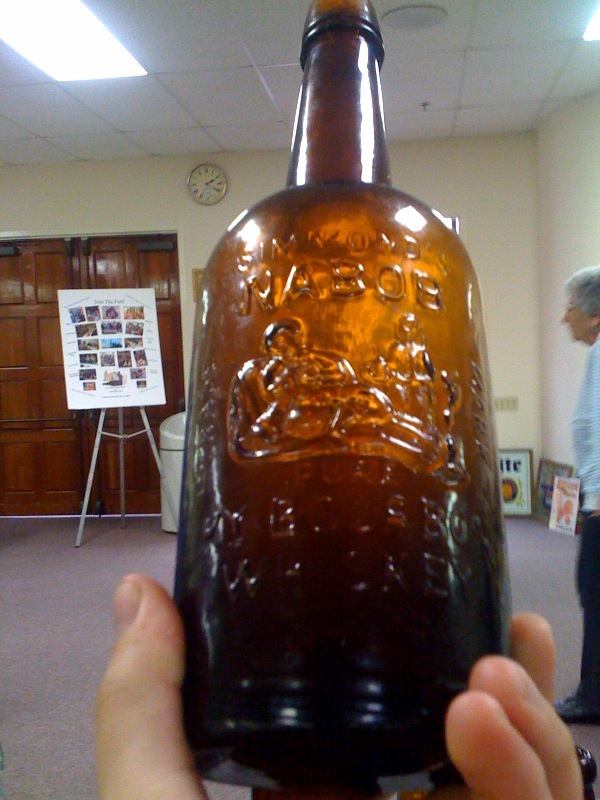 The Picture Simmond's Nabob....I managed to pick this one up for my brother since it's been the top bottle on his list for the last five years! Had to trade away a couple of tooled fifths, a newly acquired clear Boulevard Bourbon, and some greenbacks for towards this sucker. It's finally close to home, Kev! Anyone know how rare this M.J. Hardy Old Bourbon Barrel fifth is? I've heard definitely less than 10 examples known. The Thomas book says they are only known in amber. How about any others in such a light coloration?? MJH Barrel in back-lighting next to an olive-amber Sole Agent Circle Cutter. This MJH ended up being the lightest Cutter I own to date! It's as light as the yellow Lilienthal fifth I have, but has a slight orange-tone kick to it. The San Diego show was a ton of fun! Thanks to all who sold, bought, displayed, and showed up for it....Now it's time to save up, and gear up for Reno and the Star n' Shield Shoot-Out!!! It seems like few collectors are in the mood to post anything lately, but myself. Not sure why, maybe folks are "going underground" for some reason. 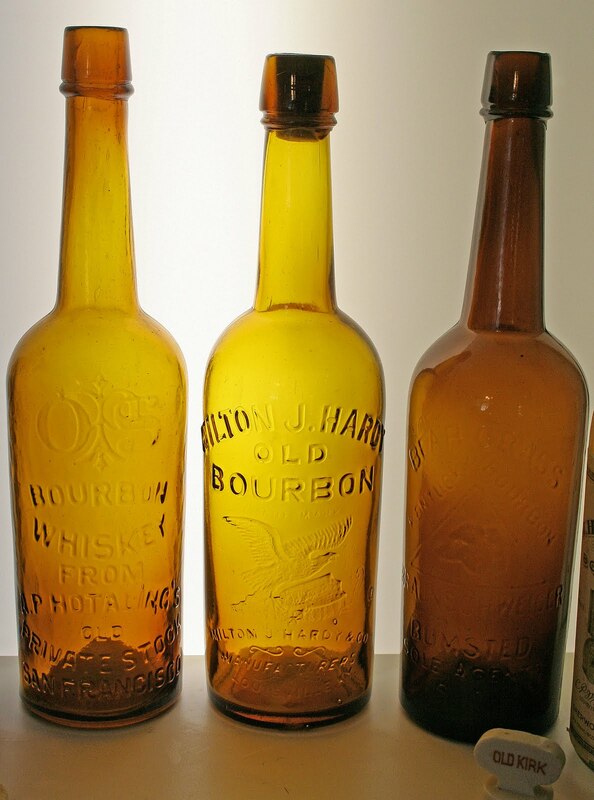 I for one like to keep things fresh, and since I am certainly no scholar on the colorful history on most whiskey bottles, I can at least contribute by posting some colorful bottles! The recent "bargain" in the latest American Bottle Auctions with the sale of an undamaged "Two Name Bear" has me a bit puzzled. Perhaps the bottle lacked any degree of character, however there have been no examples sell in the last decade at auction without some "issue" or having been heavily cleaned. This top 25 fifth just never got a push or heavy competition in this case, and for a near mint specimen, it was a great buy in my humble opinion. Maybe someone who handled it could shed some light on the overall quality of that particular example. I know the strike was not super crisp, so perhaps that was the reason. My understanding is that there are about 14 examples in collections. Here is a strongly embossed "F & B" with a bear with clearly defined and perfectly combed hair. Ok...I will quit posting for awhile, and let someone else give it a shot. Here are two examples of this popular fifth. For the supposed numbers of specimens out there, you sure do not see them all that often available for collectors. 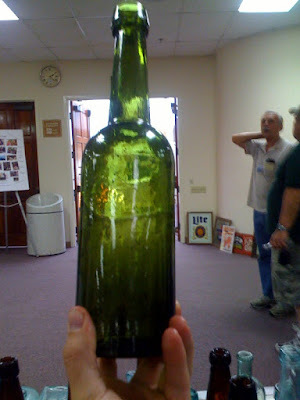 There have only been a few at auction in the past 10 years, and I cannot remember the last time I saw one for sale at a bottle show. 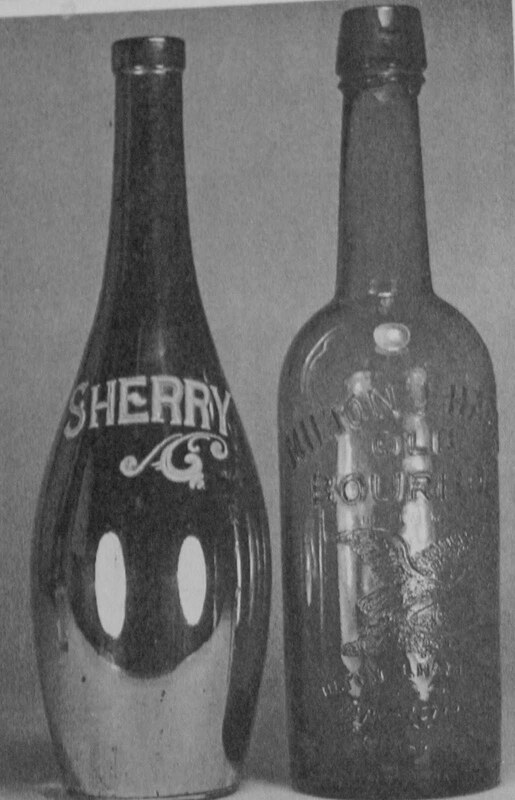 These bottles have a lot going for them in my opinion, with tons of embossing. They also have "sole agents" and "private stock" embossed. The dark chocolate was recently unearthed from a western state, and the nice green example was found in Virginia City, Nev. in the 1970s. 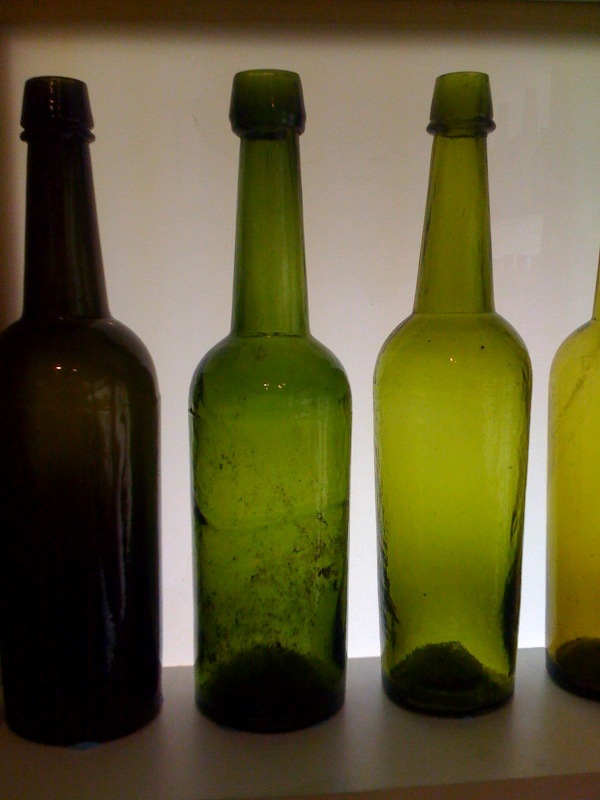 Enjoy this fantastic article that sheds light onto the prolific bottle recycling that took place in certain 19th century cities (particularly San Francisco). Published in the July 24th, 1880 Pacific Rural Press. He wore a broad-rimmed hat, and his hair was long and his whiskers bushy. He was a small man, and drove a mule that was also small, and so old that the memory of its youth must have been the merest shadow. The wheels of the little old cart were so loose on the axles that they would get themselves into the most unaccountable positions, sometimes lurching so far to one side or the other that wreck seemed inevitable. On such occasions, which were always unexpected, the little man had to lean the other way. " Rags, sacks, an' bot-tels !" Whoa, Beauty I wonder what this gentle and shy man wants. Want to sell some rags, sir ? No ! Could I ride with him ? No use stoppin' a fel¬low—a business man—fer sech a question ez thet. In dead earnest ? Well, well, well, well! Ef thet didn't beat him all holler. A fine, dressed-up gentleman a-ridin' through the streets in sich a fake ez thet there cyart—why, the boys 'ud guy me me out'n my senses.
" Rags, sacks, an' bot-tels ! " Well, jump in, then, ef I would like to hev a lift. Mebbe I was tired o' walking. He had a curious assortment of wares in the cart; under his feet, under the board that served for a seat, everywhere, mixed and mingled; gunny-sacks filled with strange things ; a box for bottles, and cups with the handles knocked off; fragments of looking-glass; dainty old shoes run back at the heels and burst at the toes (he imparted to me in strict confidence the name of the young lady who had worn them)— a great society belle; riff-raff and scum of finery, flimsiness and poverty—a very curiosity shop of exhausted economy and impatient ex¬travagance gone to waste. It was the most doleful chant I ever heard. It employed but two notes, which he always struck with exact precision. There was no refer¬ence to a tuning-fork, nor clearing the throat, nor testing the vocal organs by running up and down the scale. The burden of the chant was on the key-note, the only variation being the dropping to the fourth on the first syllable of " bottles," and then resuming the old position in the scale on the last syllable. This gave the word a strange sound, and I did not recognize it; so I inquired its meaning. 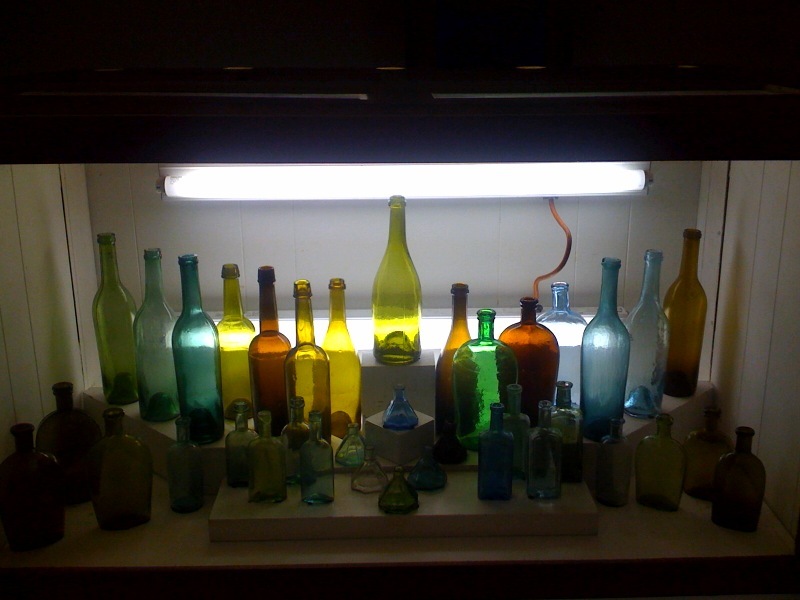 "Bottles," he replied, looking surprised and somewhat contemptuous. 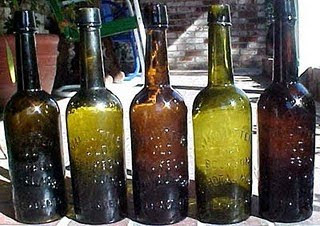 There were ale bottles and whisky bottles, a bottle the baby had used, bottles from the Rhine and Bordeaux, square bottles and round bottles, long bottles and short bottles, bottles of every nationality and pedigree, loan bottles and fat bottles, bottles with druggists' labels and bottles without labels, dirty bottles and clean bottles— a ragged and hungry army of bottles that had been through many struggles, and that were destined for many more; bottles of strong prin¬ciples, and bottles whose characters were so frail that they would crumble under the least touch of calumny or adversity—the fag end of all the disreputable bottles in creation. I noticed his keen little eyes carefully and rapidly scanning upper-story windows, throwing a quick glance into alleys leading into back yards; and the comprehensive look with which he regarded a clothes-line, with its burden flut¬tering in the wind, conveyed whole volumes of analytical discrimination. Whoa, Beauty ! He had caught a signal from a back stair, given by an untidily dressed, though good-looking matron. Beauty came so suddenly to a dead halt that the cart wheels, which had been running peacefully along at a considerable inclination to one side, lurched over to the other, as if they wanted to rest themselves by standing on the other leg, and threw me vio¬lently against the little man. "The streets," he said; in an apologetic tone, "is skimpety like, an'yer can't jess calkilate when you're a-running' a-foul of a rut." The good soul! It was the crazy old cart that was at fault; but he would hide its infirm¬ities, even at the expense of truth. "Will yer set in the cyart," he said, "an hol Beauty 'gainst I come back! She's mostly purty gentle, an' moutn't run away; but she gets lively'n strong at times, an' hez notions of her own, jess like a woman." Beauty run away ! Why, I have no idea such a thought had found place under her thick old skull for a quarter of a century. As I awaited the return of the little man, my attention fell upon the patient and decrepit dis¬guise of anatomy that stood so quiet in the patched and spliced shafts of the cart; and I could not help thinking that Beauty was made entirely of rags, sacks and bottles. Her brown hide, patched; and torn, and covered with the filth of the stable where she had lain, looked more like a sack than anything I had seen be¬fore. I was sure, her ears were the dilapidated shoes of some broken down song-and-dance man, whose trumpery had gone to the rag picker. I speculated considerably on what the old sack was stuffed with, and was forced to the conclusion that the great prominences all over her emaciated body were bottles; that the jagged ridge along the back was propped up by soda-water bottles, with the necks broken off; and there was no doubt in my mind that the lumps at the hips were Dutch bottles that were cracked, and fit for no other use. What kind of rags was Beauty stuffed with ! A problem. 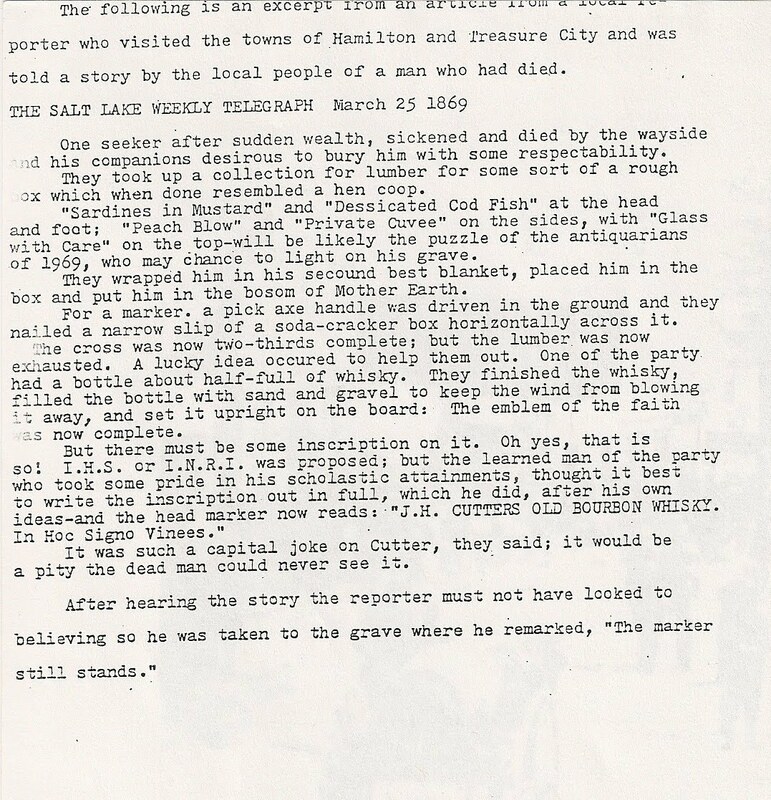 But I thought the poor old stomach contained only rags that the junk dealer had refused—such as half-wool stockings, worn out at the heels and toes; old red-flannel rags, and rags that were mildewed and rotten; rags that had been rags for three generations, and sold because a stitch would no longer hold them together. Ah ! but what kind of a soul had Beauty ? Was it, too, made of rags, sacks and bottles?—or was it woven of tine white thread ? I think not the latter, but rather that it was composed of rags that had served for blisters, poultices and oint¬ments; rags from which all life and color had faded, leaving them blank, but white, for all that; rags that had felt all the privations to which rags can be subjected, that had been torn and tattered by the winds, loft uncleansed all their natural lives, and that the rats and mice had eventually stuffed away in damp and dismal places to make nests of ; rags that had served as handkerchiefs to conceal a sigh, or brush away a tear. There were sacks in the soul, too—empty dreams of emptier oat-Backs; and bottles in which flowers had been put and left to wither when the water dried up. "Rags, sacks an' bot-tels ! " The little man came out of the gate, lugging a sack full of rags and bottles. He deposited his burden in the cart, opened the sack, peered into it, buried his arm in its contents, and fetched up an empty bottle. This he deposited in the box, and repeated the operation until he had taken out all the bottles, leaving only the rags. "Are rags dear !" I asked. "Oh," he replied, with a shrug, "a business man can't growl about trifles, you know. Them rags'll weigh 'bout 10 pounds." "How much did they cost you ?" "Well, yer see, people wants all the money they kin git. Them people in there's mighty close." And he added, with a knowing look, "There's queer stories about 'em. An' then, times is purty close. They wanted 25 cents for 'em, an' kinder stuck to it like; but I warn't on the buy thet strong, an' when I got 'em down to 15 cents, I tuck 'em." "Rags, sacks an' bot-tels !" felt at my feet in the utter blackness, and found, grinning, and ghastly, all dry, and parched, and shriveled, and whitened—a skele¬ton. The day's work was finally done, and the lit¬tle man turned Beauty's head homeward. His business-like look went out, giving place to one of sadness and anxiety. "My little girl is very sick," he said. "Yes, very sick. Most a feared she won't live long." I accompanied him home. His house was a miserable hovel, with neither floor nor chimney. The furniture consisted of a broken table, an old chair, and a quantity of rags spread in the corner for a bed. The little man approached the bed, and, with womanly tenderness, stooped down and kissed a little bundle of rags almost buried in the pile. "How is my little Mag!" The little man held up her head, and she eagerly swallowed some water from a broken bottle. "I've been so lonesome, papa—so lonesome. They all went away and left me, and a great big rat got on the bed." "Where is the mother?" I asked. I approached the little sufferer, took her tiny hands in mine, and found them cold. I kissed her forehead and lips, and found them hot. An indefinable horror was stealing over me, as if I stood in the presence of something invisible that was repulsive to nature. "Papa," she said, "did you bring me any pretty rags?" "lots of 'em, Mag, lots of 'em. Whole heaps of'em." "Let me see 'em, papa. And—and will you make me a pretty rag doll!" she asked me, hesi¬tatingly. "Papa can't make 'em as pretty as I can, and I am so weak I can't make 'cm any more." Her poor eyes sparkled as I rummaged the sacks for the finest and brightest rags, and made them into a very princess of rag dolls. She clasped it to her breast and kissed it again and again, and laughed some, and cried some, and called it pet names,' and said it was the prettiest doll she ever saw. Then she kissed me, and laughed and cried again. I asked her if she wanted something nice to eat, for I was prompted to this by the dreadful feeling that I could not understand. She shook her little flaxen head slowly, but sadly. "Wouldn't you like a nice, big, round orange!" A great, hungry eagerness came into her eyes, and the pale little face slightly colored. "Oh!" she said, "an orange; I never tasted but one." Somehow my eyes became so dim that I turned away, and discovered the rag-picker quietly crying. Then the truth came upon me, and overpowered me. There lay before me, on the bed of rags, a human being, drifting away. While church spires pointed proudly to heaven; while there were people in the world with gen¬erous but ignorant impulses; in the broad light of day, when the birds were singing, and the sun shining brightly; in the fullness of time, and by the grace of God; at the very footstool of the throne in heaven, lay that little mortal dying—of what? Starvation. "Rags, sacks, an' bot-tels !" ago. Those are very meddlesome boarders, and, comparing them with Mag, I care no more for them than for so many rags, sacks and bottles.